I started using Mozilla Thunderbird a few weeks ago for a new e-mail address that I wanted to keep separate from GMail. I’ve been using GMail for almost 3 years and hadn’t considered switching because I was too accustomed to archiving and never deleting, and using labels instead of folders. It turns out that Thunderbird 2.0 includes many awesome new features that enable it to be more like GMail, so I decided to give it a try. I’m using an IMAP server, so messages aren’t stored locally. In order to save them all, I setup a message filter on all messages that copies them to the “Archive” folder I created. Thunderbird 2.0 introduces support for tags, which are similar to labels but even better, as they can have different colors. 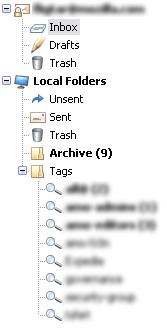 You can setup search folders that display all e-mails with a certain tag, just like in GMail, as shown on the left. 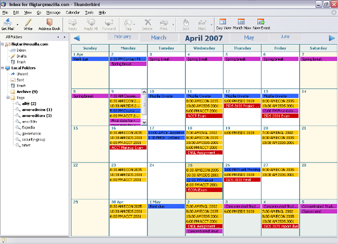 Lightning is a calendar extension for Thunderbird based on the Mozilla Calendar Project (Sunbird). Provider for Google Calendar is an extension that allows Lightning to read and write to your Google calendars as if you were using the GCal interface. MinimizeToTray lets you minimize Thunderbird to the system tray instead of to the taskbar. It also works with other Mozilla applications (Firefox, SeaMonkey, Sunbird, etc.) on Windows. Quicktext allows you to set templates that you can easily insert in e-mails. QuoteCollapse collapses inline quotes in e-mail messages. Signature Switch allows you to easily switch between signatures. I also happen to have my extensions Password Exporter and FavLoc installed, but that’s a given. Previous Post:it has a purpose!